In this 2-hour class we will review how to recognize knit, purl and yarn over stitches and teach you how to correct common mistakes caused by dropped stitches and accidental “lace” holes. You will learn to pick up dropped stitches, change the direction of a stitch, un-knit (“tink”) and safely rip back. 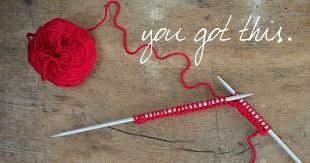 You will be amazed at how easy it can be and how liberating it is to knit without the fear of making a mistake. Homework: Using a worsted weight, light colored yarn, cast on 25 stitches and knit a 4-inch swatch in stockinette. Do not bind off. Requirements: Cast on 25 stitches and knit a 4-inch swatch in stockinette; a worsted weight, light colored yarn is recommended. Do not bind off.